TTII and Target Group of Companies know sand.. – Target Technologies International Inc. Welcome! Target Technologies International (TTII) and the Target Group of Companies – your source for high quality, best-value priced wholesale silica sand. We have been sand suppliers, wholesalers and brokers for over forty years. Silica sand is an environmentally sustainable, recyclable, commonly used commodity that has multiple uses; some examples include: synthetic sports fields, golf courses, beaches, filtration, sandblasting, traction, foundry moulds, glass production, and fillers for specialized concrete products and more! Our plant locations service all of North America, the Caribbean and Central America. Please take the time to review our product selection by scrolling down below for links to our wholesale sand products. Note: Truck/container load quantities only please. Silica sands have several origins; it is these origins that have an influence on the type and quality of the sand. Silica sand that has been formed from water eroding rock into granular pieces, over time, will tend to have a round smooth shape – in comparison to mined silica sand that may have a sharp, angular particle shape. In its raw form, contaminants (mineral and organic) are often present. To remove contaminates, TTII’s suppliers wash, dry and sieve (grade) all of our silica sand to ensure a clean, quality silica sand with consistent sizing. TTII knows there are many attributes involved in determining the quality of silica sand and we know that the supply of such material is finite. We believe in only supplying the highest top-quality materials, which has led us to form strong alliances with top-producing silica sand suppliers around the Americas. Note: Truck/container load quantities only please. 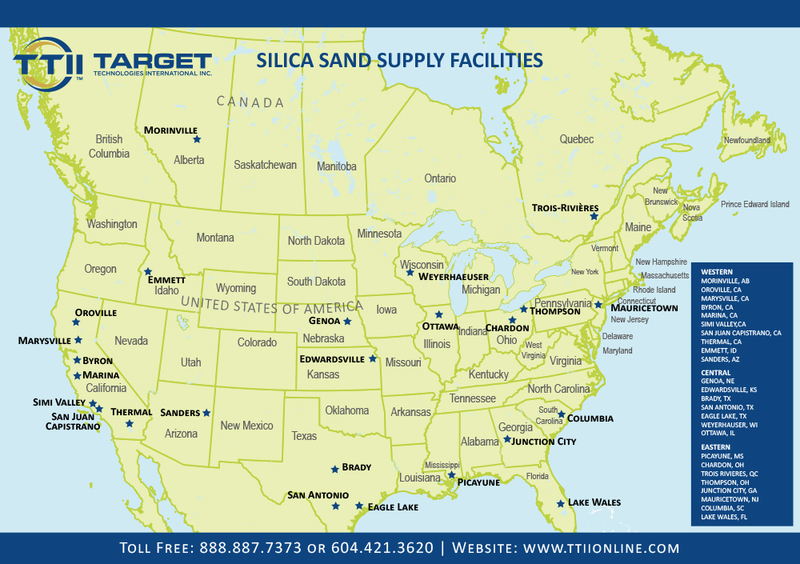 Collectively, TTII and the Target Group of Companies have supplied silica sand throughout the Americas. We are a trusted silica sand supplier to the industrial, commercial and retail industries. We are proud to have successfully shipped multiple container loads of silica sand throughout the Caribbean, Guam and the Hawaiian Islands. TTII and Target Group of Companies available sands…. If you’re looking for a specific type of sand that isn’t noted above, contact us. Together with our affiliates across North America we are confident that we can supply you with a suitable product that will meet your needs. We understand that every industry has its own specific sand requirements; let our global connections help to satisfy your needs. Make TTII a part of your team as your silica sand supplier and distributor. ***Truck/container load quantities only please.